I really don’t like to move. Yet, here I am about to make my third one in three years. It was last Fourth of July weekend that we moved in to our first place together. Later this month, we are moving to a bigger place that I plan to turn into a Scandinavian wonderland of greenery, white walls and neutral tones. I realized when we were in Sweden and Finland that I simply do not have enough plants in my life. A new place also means a fresh chance at organization. 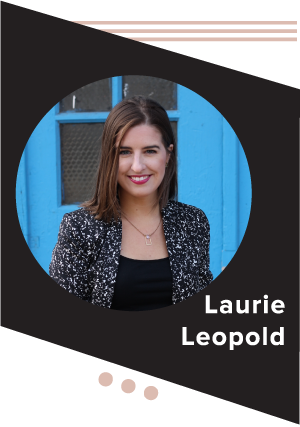 There are parts of our current apartment I really love – like our bedroom that is one of a kind, what you get in a home built in the 1800s – and elements that do not work for me: like my bathroom. 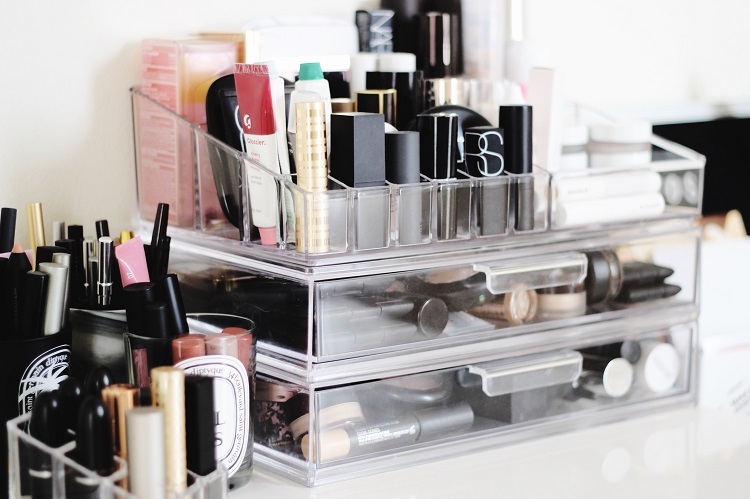 I’ve never quite loved how I stored my beauty products here. 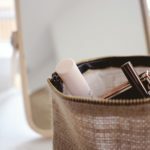 I scatter things around – beauty products are decor in my world – but I like storing and doing my makeup in my bathroom. Larger countertops are in our future and that is very exciting. I will, however, miss my medicine cabinet. I’ve gotten really used to my skin care having a ‘Top Shelf’ style home. 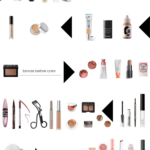 Soon, all of this will get packed in boxes, so I thought I’d share you how I’m currently storing my makeup. 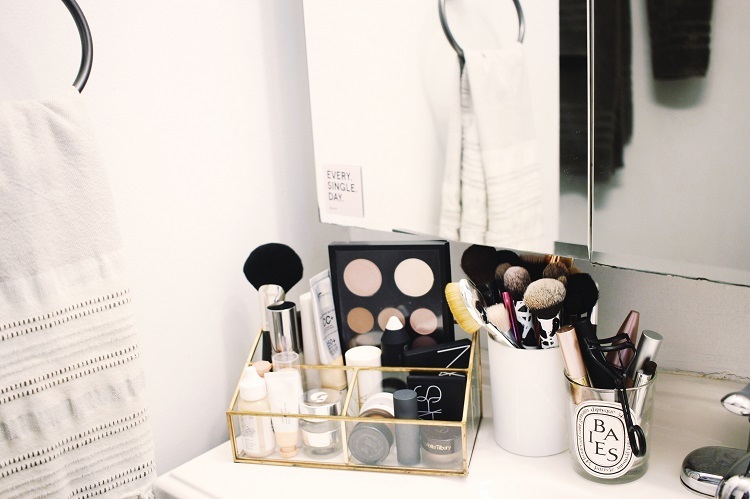 I use this glass and copper metal organizer to store the makeup I’m using now, everything that’s in my seasonal beauty wardrobe. 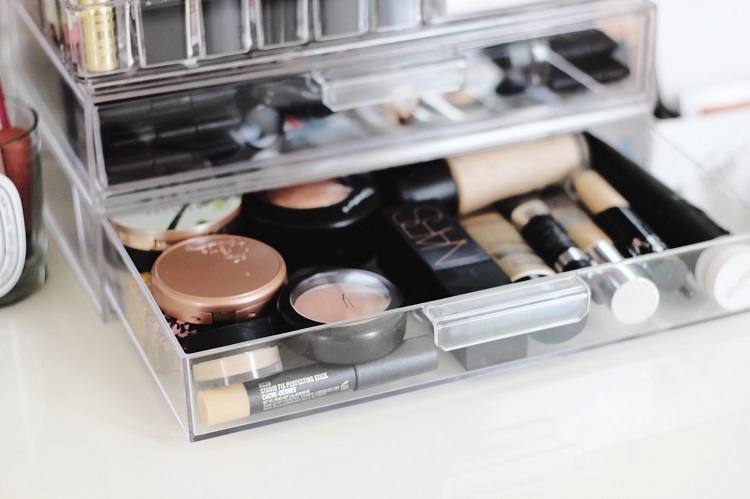 The different compartments make it easy to keep all of my makeup options yet it is small enough to keep on my bathroom counter, which isn’t huge. I also use recycled candles to store brushes and mascaras, liners, brow products, etc. Basically anything with a tall and skinny handle works well in a candle. 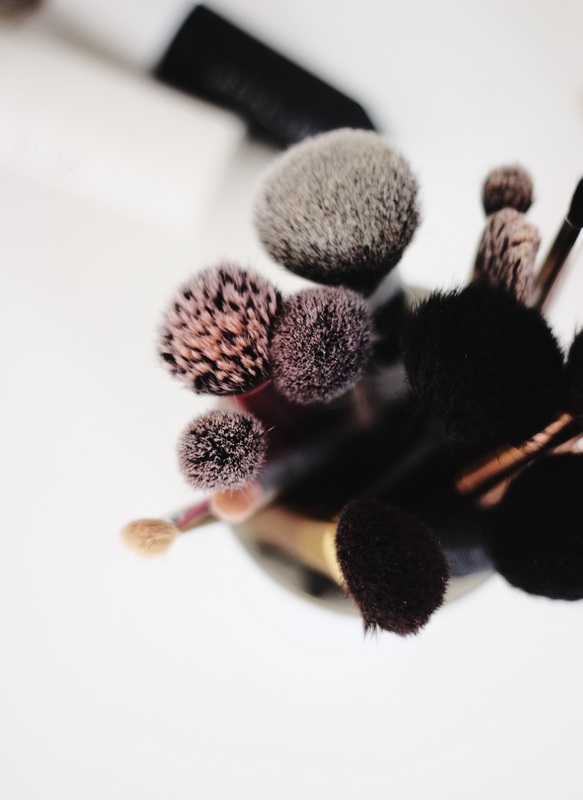 I love the Nars candle for brushes. It’s bigger than a standard Diptyque so I can store a lot of brushes in it, even the wide-handled Real Techniques. 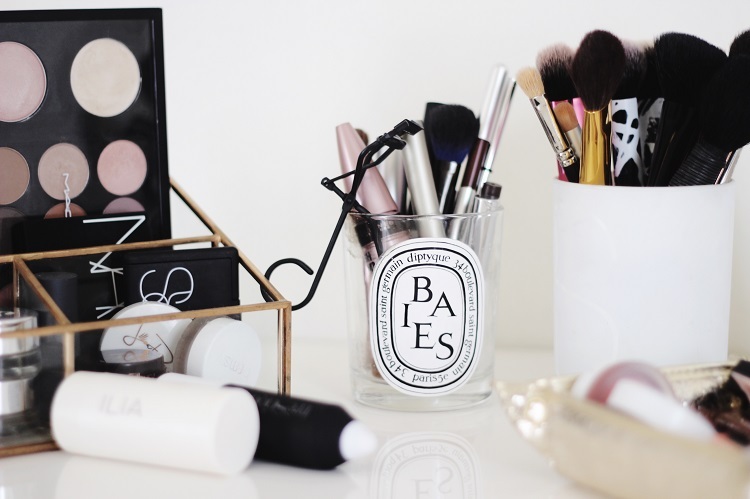 I do recycle my empty Diptyques for other beauty products though. 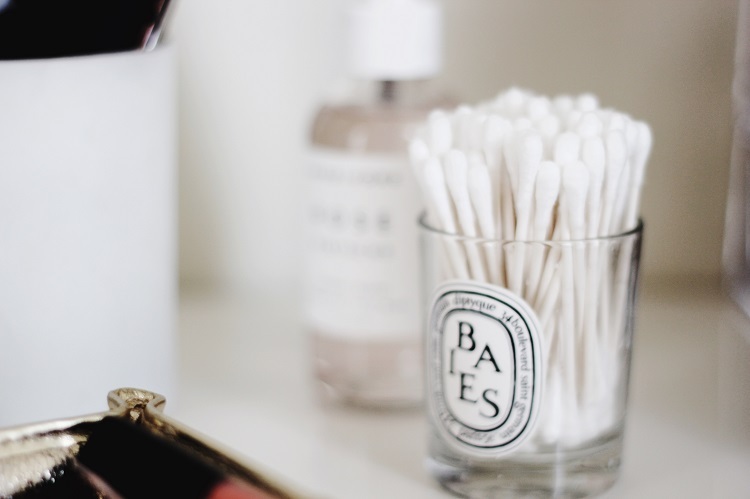 The small size is perfect to store q-tips and perfume samples. 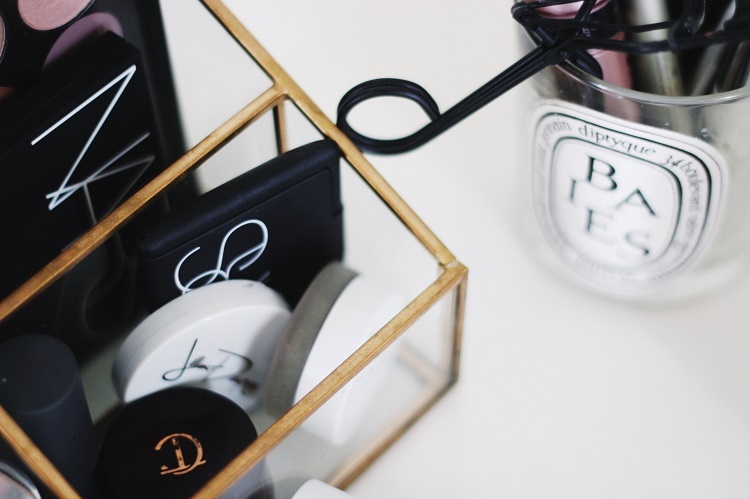 If you’re going to burn a luxury candle, you owe it to yourself to keep it around after the fact, right? 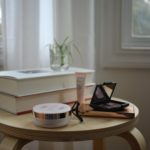 At the moment, I’m working on future beauty storage with the Overose Nudesse candle. And, then there’s the archive. 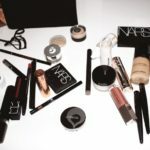 After the purge I did this year, I have less stuff but still makeup that I don’t want in my everyday storage. I ordered these acrylic stackable drawers from Amazon and a topper as well. The topper is my favorite part but it is not a perfect fit, despite it being the same brand. It’s like the tiniest bit off, so it technically works it just drives me nuts because it isn’t exact. I can’t wait to improve on this in our new home. And, I feel way better that I already got did a big purge so now I’m moving with less. 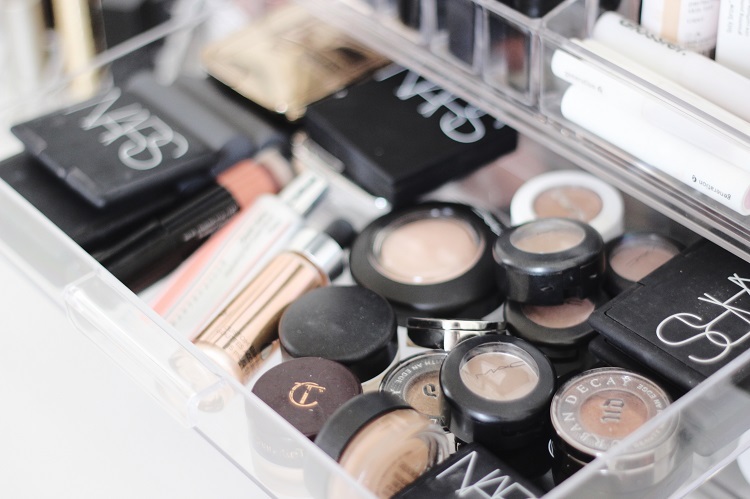 I could look at beauty organization pics all.damn.day so welcome any tips you might have. How do you control the chaos? P.S. 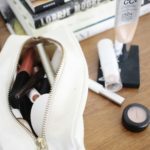 I’m over on Meg Biram’s blog talking about organization along with other beauty bloggers and experts.